Noob's Villa proudly presents an amazing software to extract Website's Data. 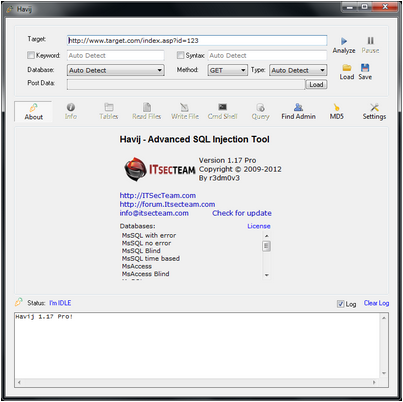 Havij is an automated SQL Injection tool that helps penetration testers to find and exploit SQL Injection vulnerabilities on a web page. It can take advantage of a vulnerable web application. 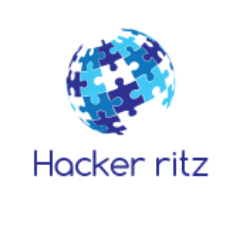 By using this software, user can perform back-end database fingerprinting, retrieve DBMS login names and password hashes, dump tables and columns, fetch data from the database, execute SQL statements against the server, and even access the underlying file system and execute operating system shell commands. 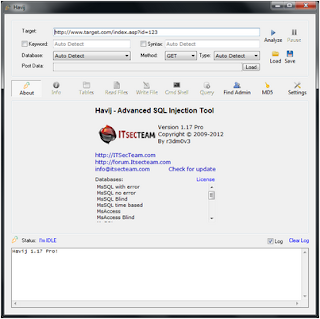 The distinctive power of Havij that differentiates it from similar tools lies in its unique methods of injection. The success rate of attack on vulnerable targets using Havij is above 95%. The user friendly GUI (Graphical User Interface) of Havij and its automated configuration and heuristic detections make it easy to use for everyone even amateurs. Automatic scan of all parameters. NOTE : It will be detected as an antivirus so disable it. Noob's Villa takes the whole responsibilty. You can use it freely. If any problem arises you can comment it. Our team will reach you soon.